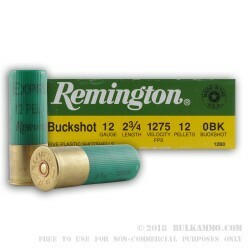 Shot Load - 0 Buckshot (12 pellets) Shell Length - 2-3/4"
This 12 Gauge shotshell by Remington is loaded with 12 pellets of 0 buckshot. Single-aught’s .32” diameter pellets are suitable for home defense, but seeing as they can sheer through sheetrock like a cat’s claws through a silk nightgown you had better make certain there’s nothing you care about or capable of suing you on the other side of any walls you fire at. Single-aught is great for hunting medium-sized game as well, especially in wooded areas where an intrusive twig could be enough to deflect a rifle bullet -- with 12 pellets to scatter, your likelihood of creating several deep wound channels could spell the difference between a great hunt and a long hike. 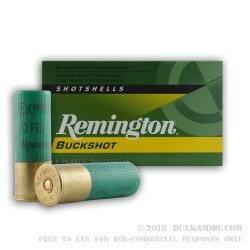 This shell also features heavy cushioning behind its shot column for more comfortable shooting, as well as a granulated polymer buffer to keep its shot nice and round so it will deliver a tight even pattern as it exits the muzzle at a velocity of 1,275 fps. 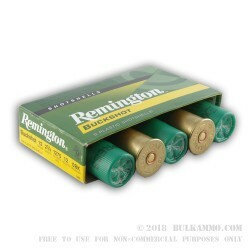 Remington makes great ammunition, and this shell is certain to live up to your expectations of the old American company.